Welcome to the second year of GURPSDay, and here’s the final pull for you guys. We’re currently drawing content from 85 blogs, having picked up Matt Riggsby’s Tetsujin no Lllama. Only 15 more to go until we’re pulling from 100! But we’ll need your help. Below you can find the blog activity for the last week. 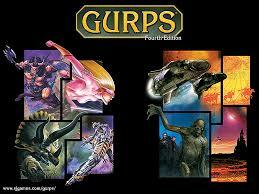 There’s a whole lotta awesome GURPS going on. Read all 35 posts as of 835pm CST. Grand Duchy 102 (4/27/17) – The Grey Company continue their exploration of the Vault of Elders and eventually find what they are looking for! Summary of the latest play session of The Grand Duchy of Adventure, our GURPS: Mystara campaign. Sundered Lands 27 (4/21/17) – Sea Harpies are fought, spells are cast, inconvenient terrain is bandied about and then something goes BOOM! The newest adventures in the Sundered Lands of Palladium, our GURPS: Palladium Fantasy campaign. Less-Technical Grappling (GURPS) (4/26/17) – Some good comments on the SJG forums about modifying grappling rules nudged me to write down a few alternate rules concepts that have been percolating for a while, in the name of speed-of-play. Stellar Dynamics PGD-1 LAMP (4/27/17) – In today’s post I give you a plasma bazooka and show you how to stat up disposable, one shot energy weapons.